Thank you for helping me achieve my dream kitchen! From the first showroom visit, Terry was so willing to help guide me through the process. This level of care was continued by Brad, who demonstrated such professionalism and a real 'can do' attitude. Thanks also to Erin for helping things happen along the way. 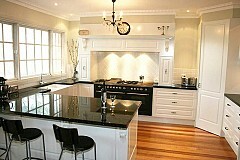 To Terry and the Crew at Kitchens Victoria, what can we say but we love, love, love our new kitchen. Everyone who has visited are quite impressed (even my mother-in-law!) 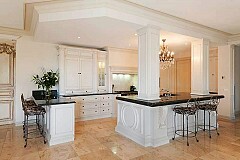 Thank you for your excellent workmanship and professionalism in building my dream kitchen LOVE IT!! To Kitchens Victoria, Kevin, Erin & All, Thank you so much for my fantastic kitchen, I just love it & everyone has done an amazing job. Thanks heaps. I get very excited when I walk into the house and see me new kitchen! The Farmers kitchen installed by Kitchens Victoria is an art piece! It is stunning and has been designed perfectly with elegance and great taste. Lindy, the design consultant was full of ideas & solutions. She was excellent to deal with, a very nice lady. Erin in administration was very professional and always got back to us promtly. All staff including installation and maintenance have been very professional and courtious. Best Cabinetry company we have done business with in 35 years. Experienced on site, good communication all the way through, great attention to detail, fair price. Certainly will use again and recommend to others. Dear Kevin & staff, I am writing this email to let you know how incredibly pleased we are with the work that has been done on our new kitchen. It was such a smooth process and the tradesman that completed our kitchen (Trevor) was fantastic, so helpful. He never once had a problem with the crooked walls and uneven floors, which I am sure was a pain. Tiling work was great as well as the plastering. Everything went to plan and it was not an imposition in any way. The cupboards and workmanship was very much appreciated. Love the drawers. I may even cook shortly !!! Once again, thank-you very much. 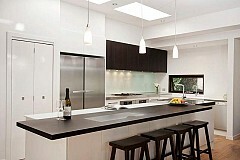 To design a new kitchen for someone else's home is always a joy. To deliver something truly special; unique to that family, and their way of living, is indeed an honour. This elegant 'Farmers' kitchen offers the owners visual pleasure, practical working and storage needs and a home core space magnetic in its allure. It must be said that the skill and attention to detail ever-present in Terry Steegstra's workmanship (and that of the team at Kitchens Victoria) cannot be underestimated in the many reasons why this kitchen is special...the symbiotic relationship between design and manufacturing is essential in creating a kitchen of this calibre. Great customer service, no high pressure selling. Simple easy process. Very happy with the end result. Thanks Kevin we love kitchen number 4!